Who is Swampy? 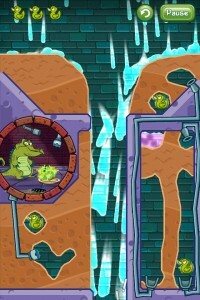 Swampy is a cartoon alligator living in the sewer under the city. He likes a good hot shower, and is more refined than the other alligator’s living in the sewer. They think he is a little strange and like to sabotage his water supply. Your job is to get the good, clean water to the end of the pipe that leads to his bathroom and gather the three rubber ducks along the way. 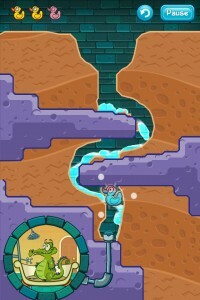 To accomplish this task, you need to draw a path through the brown dirt for the water to follow guiding it to the three ducks and finally to the end of the pipe. Yes, gravity is still in effect. The water only flows down. Sounds easy? At first it is. The levels get more and more challenging. 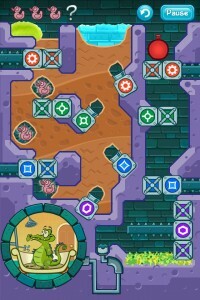 There are seven different collections of levels. Each one introduces another challenge to the puzzles. You must figure out what to do with green goo, purple poison, grass that grows to block your path, steam and that’s just the beginning. You become a chemist as you figure out how all of these substances interact and change to help you achieve your goal or thwart your efforts at every turn. By the end of the game, all of the challenges that you have faced throughout the game come together to challenge you in whole new ways. You have to use everything that you have learned in the previous levels, and sometimes you just have to keep trying over and over to figure out what will work. Along the way there are items to collect hidden in the ground. You can tell which levels have a hidden item by looking at the top of the screen for a question mark next to the 3 ducks. Be careful not to destroy your path while digging for treasure. There are also achievements to get ranging in difficulty from easy to nearly impossible, as far as I am concerned. Recently, Disney released an update for the game that changes the whole perspective of the game. Now you are trying to help the alligator, Cranky, the very alligator who always sabotaged Swampy’s water supply. Cranky has a different problem. He doesn’t care about showers and clean water. He is hungry! There is plenty of gross, rotting food in the sewer, which he doesn’t mind. What he can’t stand is vegetables! Unfortunately, his foot has been sitting in the damp sewer so long that is covered in algae. I guess he considers this algae to be a vegetable because he won’t eat it. He needs your help to get rid of the green stuff. So, you must use the purple poison to clean off the algae so that he can eat the food. You still need to collect three ducks on the way, but don’t do it with water. These are Cranky’s ducks. Water will kill them. Not only will the water kill his ducks, but it will make the algae grow making your job even harder. 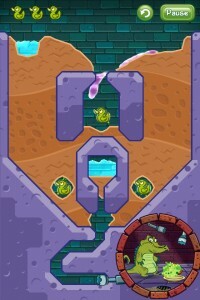 These new levels start off easy, but very quickly build on the knowledge that you gained helping Swampy. The only drawback is that Disney only gives you five levels as a taste of the game. After that you must buy the rest of the levels in the iTunes App Store for $0.99. I haven’t done it, but if the rest of the game holds up the the reputation of the first parts, it very well could be well worth the cost. 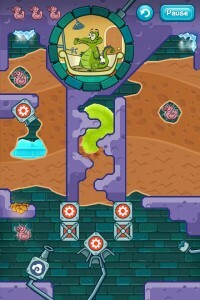 Where’s My Water has been holding strong at #1 in the App Store for quite some time now, and I can see why. It is a great game for all ages.